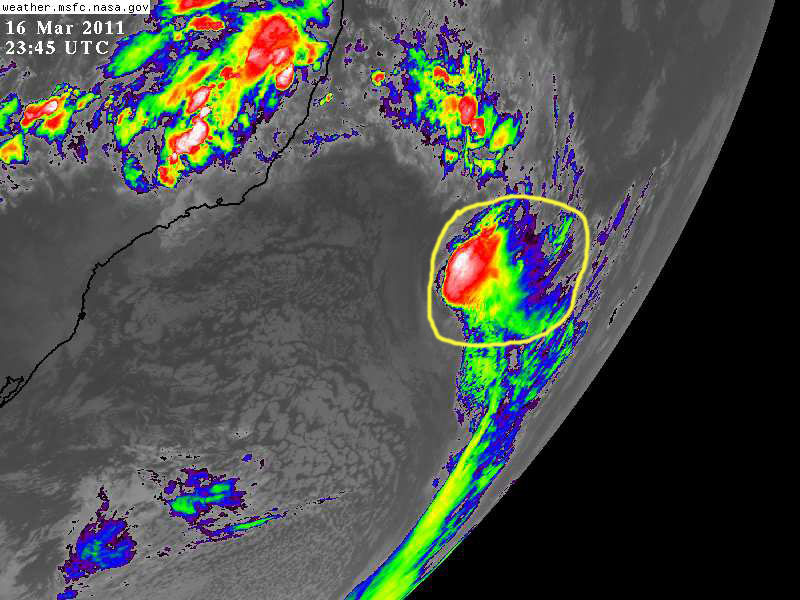 We are coming up on the 8th week into the 2011 Atlantic Hurricane season, and for those of us who monitor tropical cyclone activity there are some interesting “happenings” that have taken place in the northern tropics so far this year. 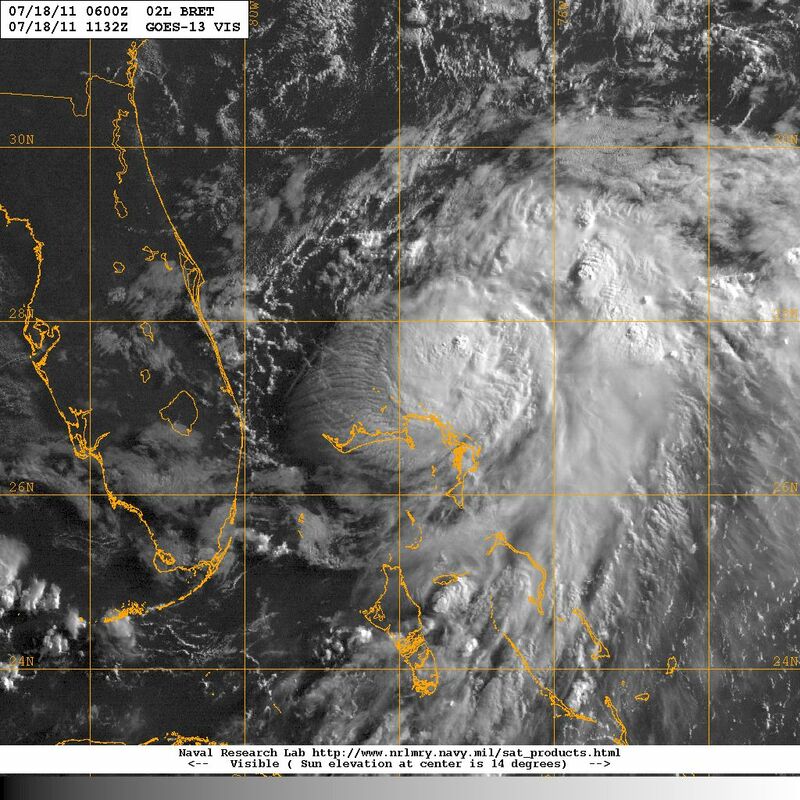 Tropical storm BRET, shown on the NASA satellite image from the early morning of 18 July 2011, is an interesting example of a tropical cyclone that departed from the historically traditional sources of cyclogenesis in the larger Atlantic basin. 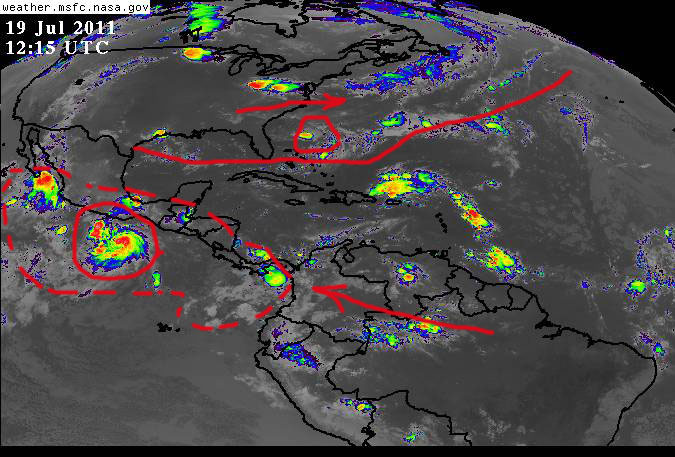 Typically the main triggers for cyclogenesis in the Atlantic basin involve: (a) tropical waves generated over equatorial Africa moving over the eastern Atlantic, riding the warm waters of ‘hurricane alley‘ until they encounter favorable ocean-atmospheric conditions for tropical cyclone generation; (b) low pressure systems that develop in the Caribbean or the southwestern Gulf of Mexico, which become tropical depressions and eventually tropical cyclones. 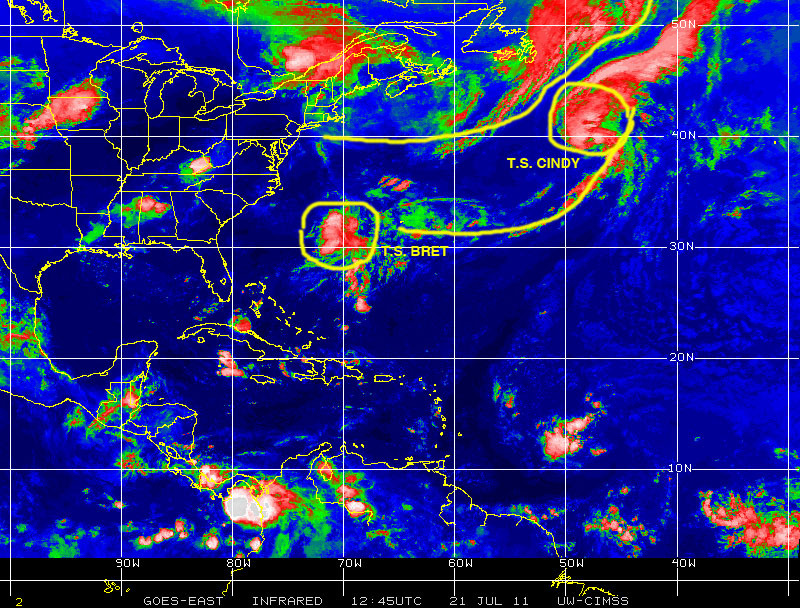 The historical record shows tropical cyclones generated in the Atlantic basis generally track from east to west, or from east to northwest or north, and in some cases re-curving toward the north or northeast or even back east under the influences of the Coriolis force and prevailing winds and other atmospheric factors. 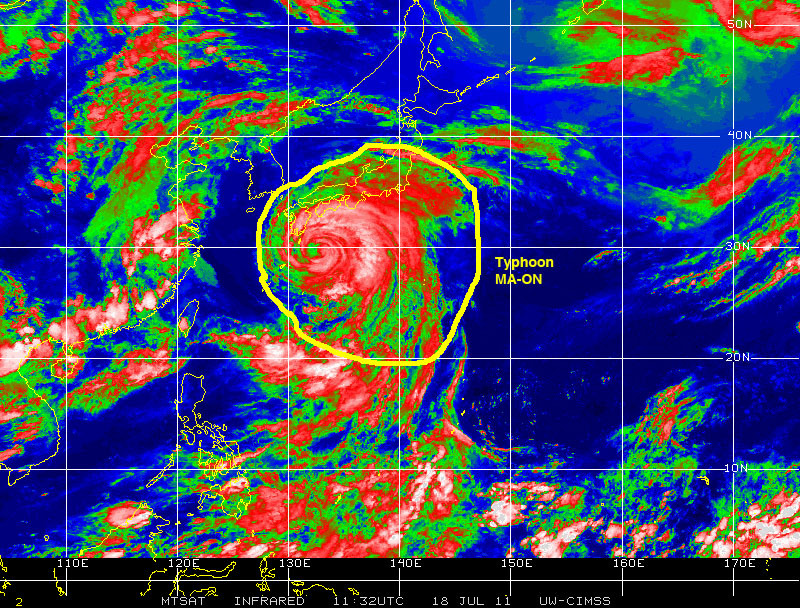 While not unheard of, as evidenced by some rare examples in the historical record, it is an exception rather than the norm to see a cyclone generated that far north to then travel southward. 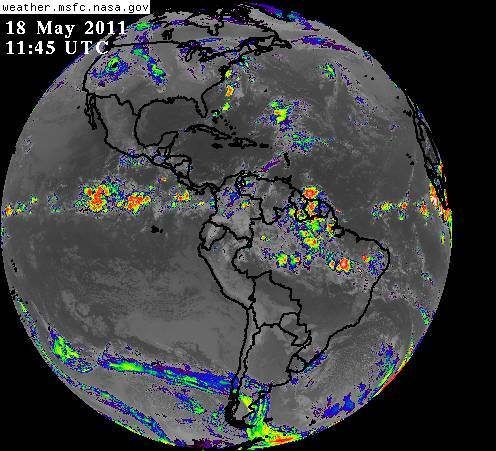 A well know contributor to cyclogenesis over the Atlantic basin is the so-called tropical wave assembly line that takes weather “pulses” generated over the Indian Ocean and Arabian Sea as they move over equatorial Africa, to generate cells of disturbed weather usually resulting in thunderstorms and rains across the continent, which create a train of tropical waves moving toward the west until they emerge over the warm waters of the Atlantic to the south of the Cape Verde Islands. 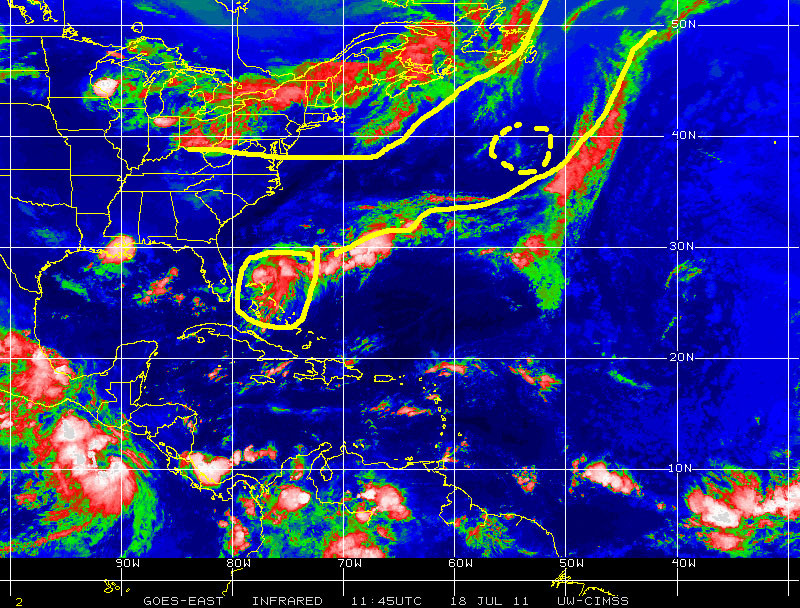 The tropical-wave assembly line contributes the storm cells, the disturbed atmosphere, that combine with warm sea surface waters of the Atlantic, another required contributor to the process of cyclogenesis, along the so-called “hurricane alley”. When the combination of tropical waves and warm sea surface waters encounters favorable wind patterns, meaning generally westward steering winds and negligible to no wind-shear aloft, the basic conditions are given that will promote cyclogenesis, provided other external triggers and factors, such as the presence on El Nino or La Nina (ENSO), the current conditions of the Julian-Madden Oscillation over the Pacific, and the location of the Bermuda High, are all in equally favorable combined alignment. 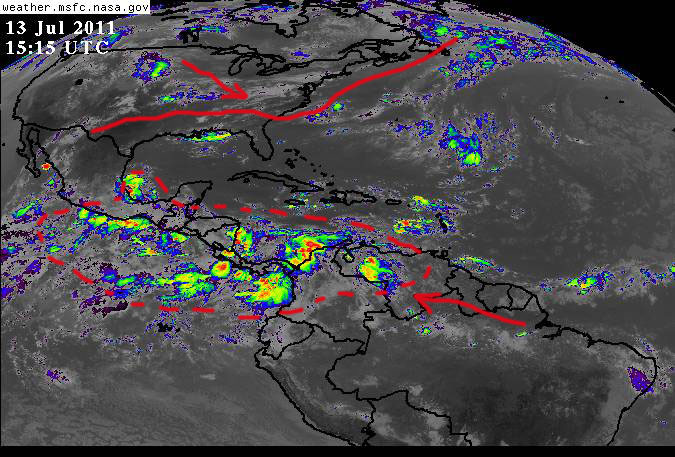 Although cyclogenesis taking place in the Caribbean of Gulf sub-basins follows a different causality than described before, the tropical wave trigger in the form of a tropical low or tropical depression or a cell of precipitation and thunderstorms is still an essential link in the chain of events leading to tropical cyclone formation. 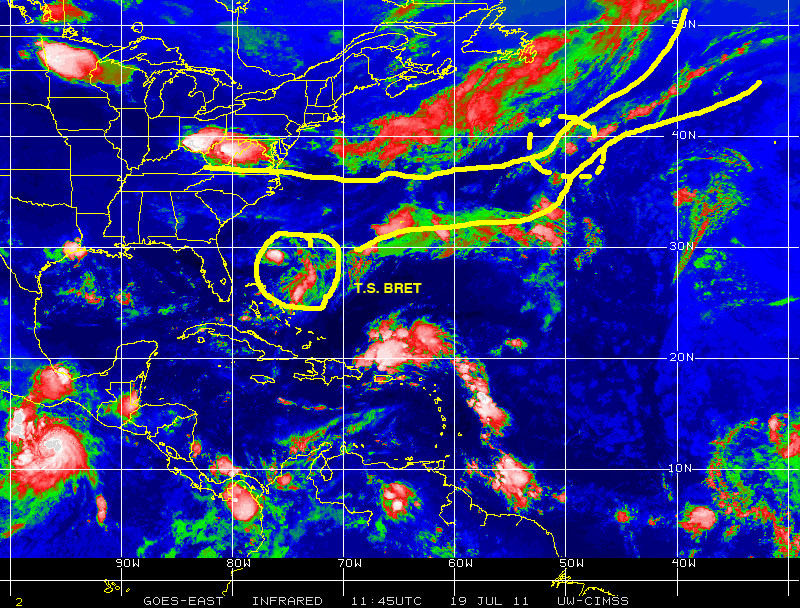 From this it follows that hurricanes or tropical storms generated over the open waters of the Atlantic require the pulses sent by the tropical-wave assembly line described before. 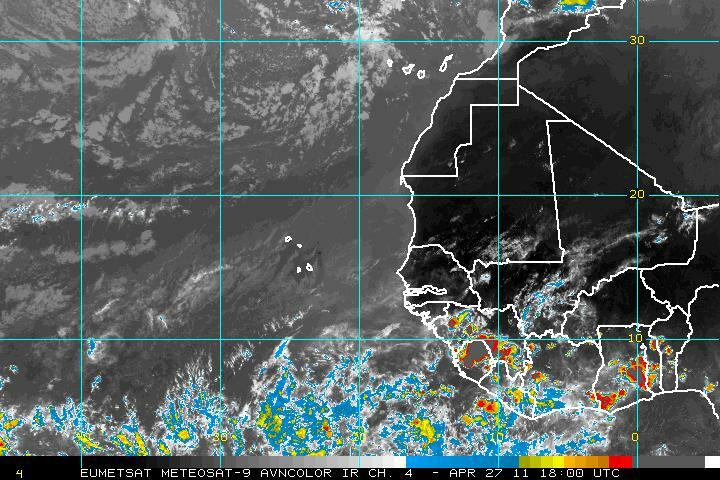 What has been interesting during the first seven weeks of the 2011 Atlantic hurricane season is how passive the tropical-wave assembly line had been over Equatorial Africa. 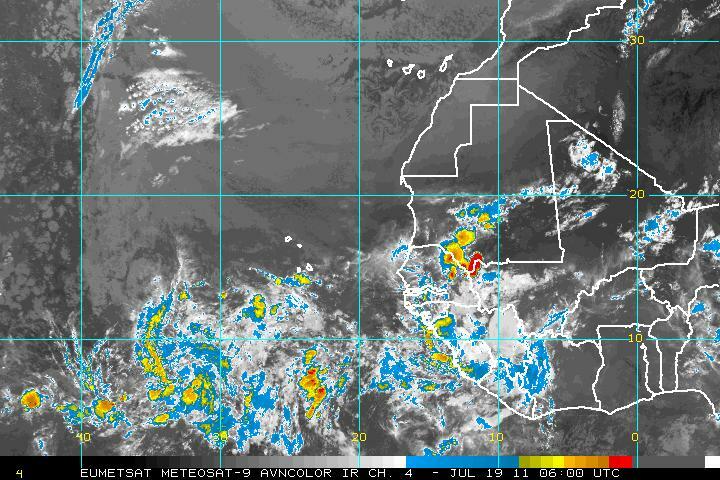 Whereas at this time of the year we could observe a veritable train of clearly identifiable tropical waves, spaced 150-200 kilometer apart, marching westward over Equatorial Africa toward the eastern Atlantic, during 2011 so far the production of tropical waves has been sparse and lacking the regularity in spacing and intensity required to maintain the assembly-line quality. 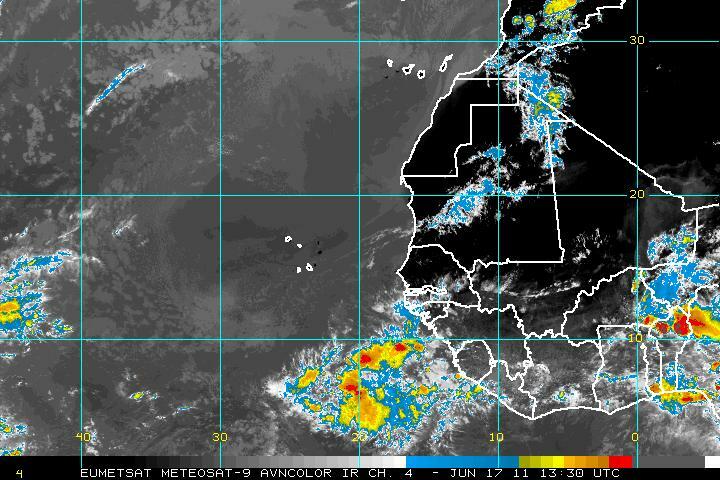 Few strong tropical waves have made it to the waters of the eastern Atlantic, and in instances when some regularly-spaced waves have finally moved over hurricane alley their intensity and size have lacked the strength to survive the entire crossing over the Atlantic. 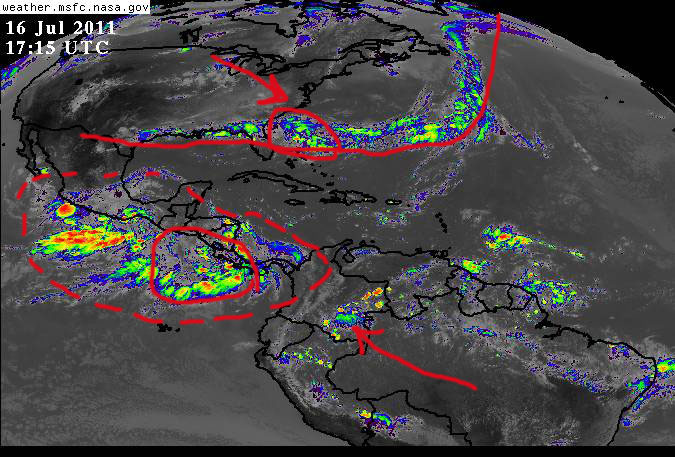 From these satellite images it is clear that the pattern of strong evenly spaced storm cells that are typical of the tropical-wave assembly line, during most of the Atlantic hurricane season, have yet to materialize during this 2011 Atlantic season. 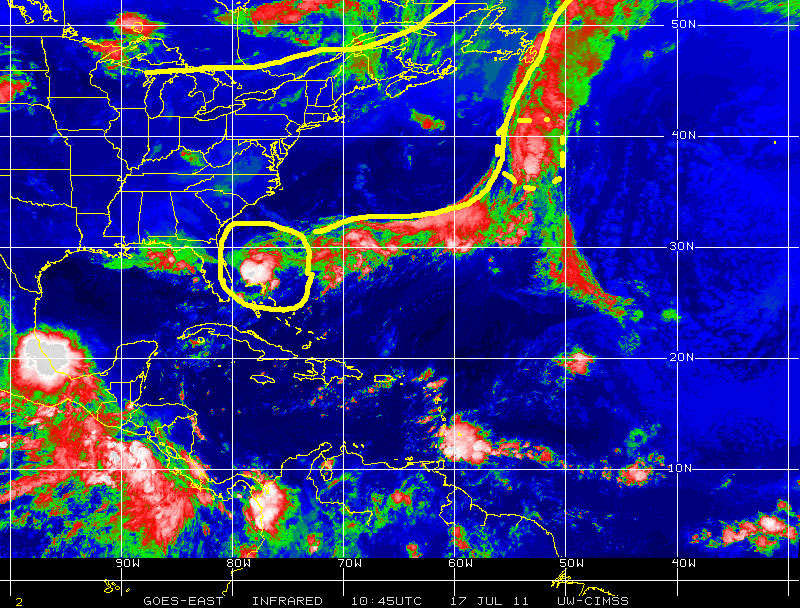 The net result of this sub-par tropical-wave assembly line is an equally inactive hurricane alley. 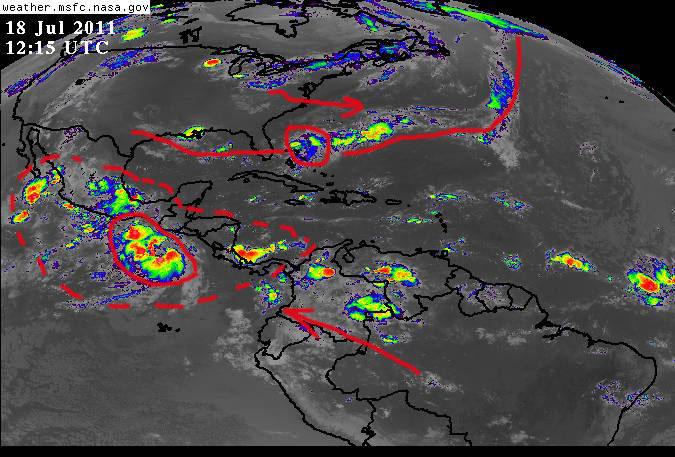 When compared to previous years, say the last 5 – 7 years, in June and so far in July hurricane alley has had what could be called light traffic both in terms of the number of tropical waves traveling on it and the size and intensity of the same. Also of interest regarding traffic along hurricane alley observations appear to show whatever traffic there has been, since the start of the 2011 hurricane season, has stayed closer to the equator [to the south of hurricane alley]. 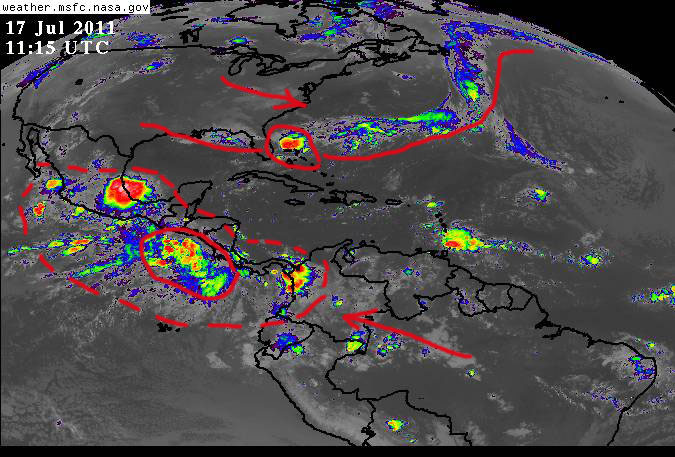 As a consequence of this instances of disturbed weather, extreme rain and thunderstorms over northern South America [Colombia and Venezuela] have lingered over the region generating another tropical-wave assembly line, which send pulses toward the Pacific. 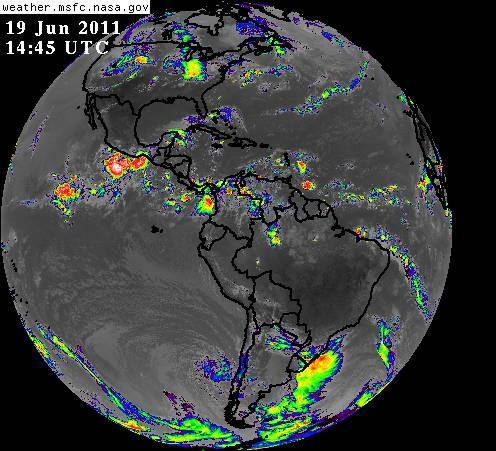 In turn, this has generated long lasting bouts of disturbed weather, extreme rain events and thunderstorms over Panama and Central America and adjacent Caribbean and eastern east Pacific waters, which have also contributed to cyclogenesis in that region. Hurricane DORA [see GOES satellite image below], which appeared to be strengthening on 20 July 2011, is a good example of such activity. 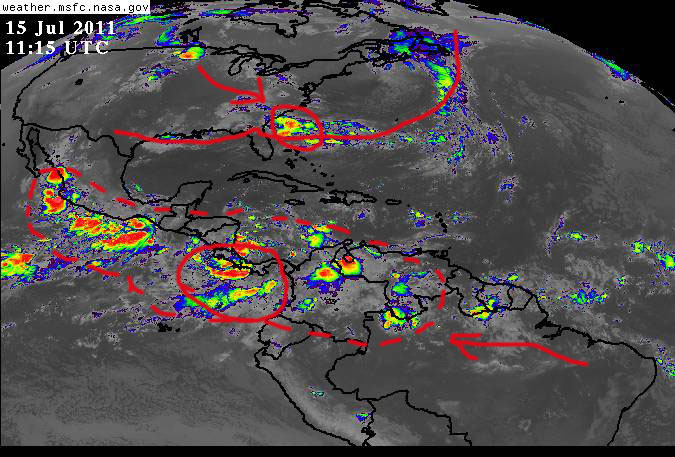 From above images it is clear most of the tropical weather activity has been taking place in the eastern east Pacific and over Central America, Panama and northern South America and adjacent Caribbean waters. While this pattern is not necessarily rare for this time of the year, my observations and comparison to prior years indicate similar conditions of intensity and lingering appeared in 2010 and as a result Central America, Panama, northern South America and even southern Mexico suffered above average precipitation and several flooding events. In 2010 this regional pattern was attributed mainly to the then present La Nina off the coast of Peru, but now in 2011 with a basically neutral ENSO conditions [meaning little to no anomalies exist in sea surface temperature conditions] it may indicate other factors may be at play in the generation of regional weather conditions described before. 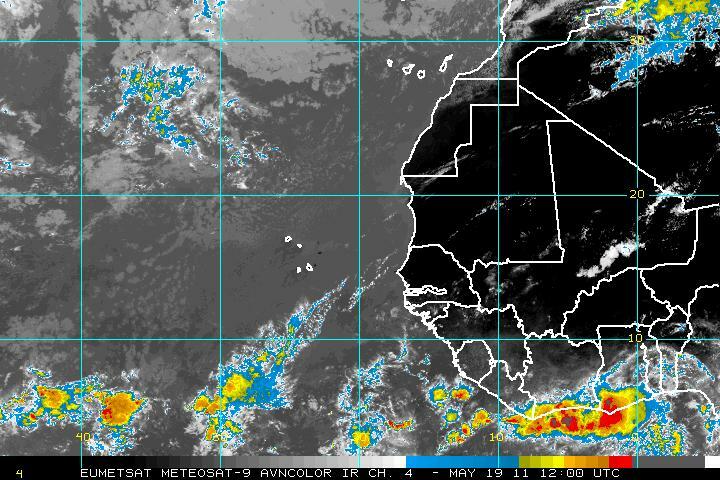 It is clear continued observations and analysis will be needed to determine what other causes may have been contributing to such weather activity.